Meet Torty! She’s one tough little tortoise with a beat-up shell and some missing toes. Torty survived a great war that raged in Europe 100 years ago. 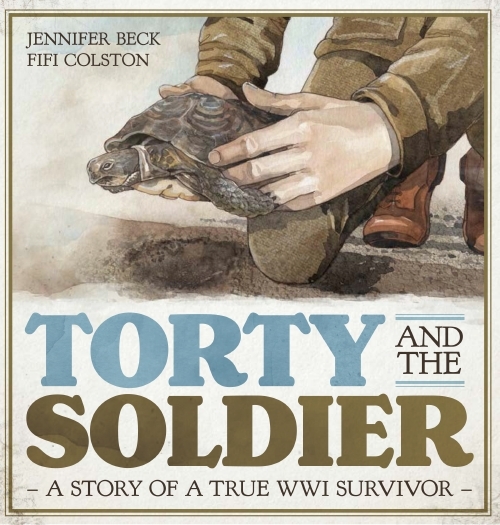 Torty was rescued back then by a young Kiwi soldier. She is a World War One survivor! In York, England; I’m a Yorkshire Pudding! I went to 9 different schools because we were a family who moved about a lot in the air force. The last one was Wellington Girls' College. At home I was always Fifi or Fif but I was embarrassed by that at school so to everyone there I was Fiona, which is my real name. I came out publicly as Fifi when I went to Design School—it suited my personality far more! Hugely talkative, always drawing and easily upset by injustice. I went there unwillingly and was hopeless at sports. In high school I drew hearts and flowers and messages about boys all over a newly sanded desk, which was about to be varnished. The teacher found me out and I had to sand it down again in my lunch hour. As a small child, The Silver Thimble Storybook by Rie Cramer. It was full of retold Hans Christian Anderson stories with truly beautiful illustrations. It was the first book I can remember reading 'all by myself'. I still have it and cherish it. I love some of them for things other than writing. Kate de Goldi is a wonderful and inspirational speaker. Ruth Paul is one of my best friends and we have lots of fun together. Kyle Mewburn makes me laugh; David Hill is a wonderful gentleman...I could go on! Anything my son makes—he is a brilliant chef and he cooks for us all the time! Rie Cramer. I thought 'If I could draw like that, I would be happy'. For writing, all the teachers who ever encouraged me to write gory ghost stories and romantic novels. And that was just at primary school! According to my mother, as soon as I could hold a pencil. I can’t remember a time when I didn’t draw, read or write. I can remember trying to get better at all of them. When I was finishing high school I knew the next step was art school. I was 18 when I went to Design School. There was never a time from the age of 8 when I thought I’d do anything other than be an artist of some sort. I was 8 when our family came to New Zealand to live. I knew I could do anything here. My illustration work is such that the idea has been thought of already and I just have to think of how to bring it into a picture form. My writing and Wearable Art ideas pop into my head at strange times, like the middle of the night. I have had many over the years, from bedrooms, offices, cottages and shared spaces with others. But I always take my big old desk with me that I’ve had since I finished Design School. Right now I am working at it in my lounge. Not wearing a uniform or having a set lunch hour. I can wear and eat what I like, when I like! What do you do when you aren’t llustrating? I make Wearable Art (that’s a big part of my life). I visit schools and run workshops; I’m on several committees, and I put quite a bit of time back into the writing and illustration community. I think that’s important, to do some stuff for free. When I was 6 I wanted to be an air hostess (I liked the hats they wore), a coin collector (I had a collection my father had bought back from different countries), and a nun (I’d been to see The Sound of Music and it seemed like fun). Rie Cramer (1887–1977), the author and illustrator of The Silver Thimble Storybook. I would like to talk to her, look at her original illustrations and tell her she lit a flame for me when I was a small girl and it has burned brightly ever since. We have a cat called Tre and he leaves white cat hair EVERYWHERE. I have to use a pet hair roller before I go anywhere, especially on my bum, because his favourite place to sleep is on my writing chair!